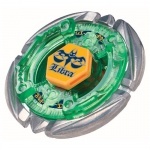 The Face on this Beyblade depicts Libra, the seventh astrological sign in the Zodiac. Libra’s symbol is The Scales, and this motif is featured on the Beyblade’s Face and Clear Wheel. The regular release of Libra is a translucent green, featuring scales on opposite sides. The original mold of Libra does not fit Metal Wheels correctly, resulting in a loose fit and rattling. This was later rectified in the Hybrid Wheel Reshuffle Set (Stamina & Defense) release. The Metal Wheel Flame was first released with Flame Sagittario C145S. It is predominantly circular, with two small spikes and two additional smaller gaps on its circumference. The Wheel is relatively thin throughout, with the very edge of the Wheel being slightly thicker. Due to the design of Flame where the Wheel’s perimeter is raised slightly, more of the Track below is exposed compared to other Wheels, hence making it easier for other Beyblades to strike its Track. This significantly reduces its Defense capabilities. However, the raised perimeter allows slightly more wobbling time, as the raised track reduces floor scraping. T125 has four upward-facing wing protrusions spaced apart widely. The Track is designed to work in a similar way to DF145, although the effect it produces is negligible. The performance of this Track is similar to D125, and as a height, is generally overshadowed by CH120. T125 can be utilized in the combo - MF Gravity Perseus T125 RF. The Eternal Sharp tip features a free-spinning tip attached to a metal shaft which is held by the Bottom. The part was one of the most heavily anticipated parts in the MFB lineup when first announced, but ES is actually a hugely disappointing part in terms of performance. Firstly, ES lacks a metal bearing, which would significantly reduce the friction between the free-spinning tip and the rest of the Bottom. All of the best free-spinning tips, notably Bearing Core, had NSK Shield bearings which allowed unhindered spin. Secondly, the tip shape of ES is not conducive to optimum Stamina; the sharp nature of the Bottom means it is easily destabilized. As all Sharp tips do, Eternal Sharp also has trouble regaining balance, hence making this a poor choice for Stamina. That said, ES still remains superior to BS and S as Stamina Bottoms. Flame Libra T125ES only adequate part is Flame, which can be obtained from the infinitely more useful Flame Sagittario C145S. As a result, this Beyblade should only be purchased for collection purposes. This page was last modified on 12 October 2014, at 21:10. This page has been accessed 179,152 times.